BOISE — The Race to Robie Creek has been dubbed the toughest half marathon in the northwest because in order to complete this race runners have to climb Aldape Summit in this classic Boise run. 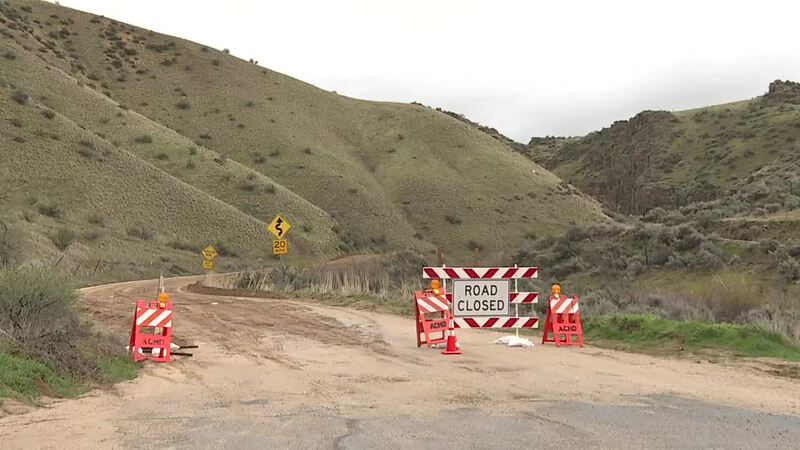 However, Shaw Mountain Road, the route where the runners will climb through the foothills has been closed to the public in Rocky Canyon because the creek flooded the road causing damage. ACHD is working on repairing the road and we saw a whole convoy of trucks carrying dirt and sediment up the canyon from where the road is closed when Shaw Mountain Road changes from pavement to dirt. "I got some emails last night asking if we were going to cancel the race and no we are still on," said Brian Rencher a board member of the Rocky Canyon Sail Toads the sponsor who organized the Race to Robiie Creek. "The run will go off without a hitch." The Race to Robie Creek sold out in thirteen minutes after registration opened, on Saturday, April 20 around 2,500 racers will try to finish this challenging course that has become a tradition for many people in Boise, including Rencher who will run it for the 34th year. "I am one of those guys that went and did once and I was hooked," said Rencher. "It's kind of like why do the salmon come back." 30 states will be represented, there will be runners from Canada and even if complications arise and that road doesn't get fixed it doesn't seam like that would be a deterrent for runners, several posts on social media actually indicated that they would be stoked on a wilder trail run.